All Your Laundry Needs One Great Price! 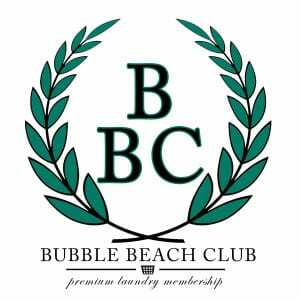 What is Bubble Beach Laundry Club? It is a revolutionary approach to laundry service offering all your wash & fold needs at a set monthly price. No more math or guessing how many pounds your laundry weighs. Your laundry at a fixed price. Membership is subject to availability and limited in number. Simply select the plan, create an account and finish up. As easy as 1, 2, 3. And now your laundry is as simple as drop-off, pick-up, put in drawer. 1. Each customer will get a special 24″ by 36″ bag that you can pick up at Bubble Beach and you will use this bag each time you drop-off your laundry. 2. All you have to do is put all your dirty laundry in the bag and drop it off at Bubble Beach. We will have it back to you the next day or sooner, all sorted and folded. 3. All your laundry must fit in the bag and you can bring in your bag up to twice a week.